It has been a gorgeous winter wonderland outside the past couple of days! Who knew I would see this much snow near the coast of VA?! In our area, I believe we got about 6 inches. Unfortunately, Travis couldn't be here to enjoy with us but we still had a good time. I hate that he missed it though because he has been wanting to see Oscar play in the snow for a long time now. We only got a little snow last year so he didn't really get to see him play and he was deployed when Oscar was a puppy and got to play in the snow. Guess he will have to wait for next winter now. 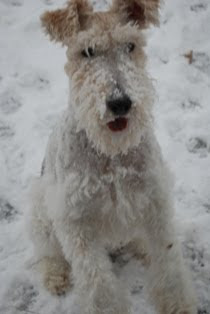 Oscar has always loved the snow and has had the BEST time playing in it with his tennis ball! Not sure how long it will all stick around. The sun has been out the past two days but there is still a ton of snow! Here are some pictures of the past couple days and our fun snow adventures! Ready to play! Right after we got out in the snow Saturday morning. This is his get ready stance! Out in the yard with his tennis ball and a nose full of snow! He was so covered in little snow balls all in his fur! Peeking through the window with his snow covered tennis ball! I couldn't get him back inside on Saturday! Patton did NOT like the snow at all! 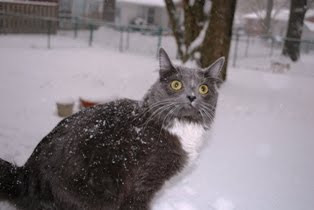 I think the snow that was falling was what really freaked him out so he wouldn't even move when he got out there! He liked to watch Oscar through the window much better than being in it! Icicles on the house on Sunday morning. So pretty! Sunday morning play time! Ready for me to throw the ball. Digging for the tennis ball in the snow! Jumping toward me to give me the ball back. 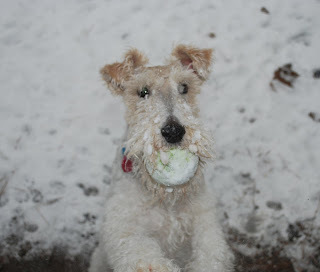 The snow ball in his mouth is the tennis ball. This is the mini snowman I built for Travis. Frustration on the Creative Front! So I have had my etsy shop on vacation mode for about a month now. I had really big projects I was working on before the holidays and then went out of town. I was hoping by now I would be back up and running but that just hasn't gone down like planned. With Travis getting deployed to Haiti and other crazy things going on, I have just now been trying to create new items. I was hoping when I opened back up, I would have new things in my shop so I got out all my supplies and started to get to work. And I have already hit a creative road block! AHHHH!!! And when I do have a fabulous idea that I am super excited about things just go all wrong- such as a piece of paper I was putting on a frame was thinner than normal and wrinkled so bad that I had to tear it off. Now I am totally stumped on what to do with this frame especially since I was so excited about it. I also hate when I finally do come up with and idea and then I can't figure out how to execute it like in my mind. Oh me... this is why I slacked off on my shop at the end of last year! But I need to push through this block of mine because it was part of my New Year's resolution to be very productive with my shop this year. So wish me luck! Well it has been a very interesting couple of days, weeks since I wrote last. Everyone knows that there was a huge earthquake in Haiti and that they needed much help to recover. A day or two after the earthquake, Travis informed me that there was a great chance that his unit and a couple others from around here were going. After a few days of Travis being at work ALL day long and only home to sleep, he got the word on Martin Luther King, Jr. Day that he was leaving. He came in the house and woke me up to tell me he was leaving in 2 hrs. We didn't get much of a goodbye or much notice at all for any of this but I shouldn't have expected much since we didn't have a lot of notice when he deployed to Iraq either. Traivs left Monday the 18th to head down to Fort Bragg then on Tuesday he flew down to Haiti. Only four of them went down there to see how things looked and to organize for everyone else to come down. Everyone is slowly showing up. The LCU boats from here at Eustis are beginning to show up with all the equipment so Travis is very anxious to finally get started with what they went down there to do, which is help rebuild the port for supplies to come in easier. Phone service isn't great but we have gotten to talk a few times since he is down there. He has been super busy so we don't get to talk long but I still love to hear my phone ring and know it is him. We don't know how long he will be gone but I am hoping that it isn't for more than 6 mths. I am doing well, just trying to adjust to him being gone and doing things alone again. It is always so strange the first couple of days and of course very lonely and boring! How I did this for 15 mths is beyond me! haha! Travis is very excited about this mission and I am very proud he can go down there to help. But I just ask that everyone keeps Travis, his unit, the others from here going, and myself in your thoughts and prayers. Happy 3 yrs to Us! On January 6, it was our 3rd year wedding anniversary. We didn't get to celebrate this day because we were in the car for 10 1/2 hrs driving back home from TN. It was a LONG drive and something we didn't want to do, especially on our anniversary but at least we were together! But we decided to go out and celebrate out anniversary this weekend. So we got all dressed up and went out to dinner to come home and have a relaxing evening. These pictures are from our night out. I can't believe that 2009 has come to an end and that it is already 2010! I hope that everyone has a happy, healthy 2010. If you have made a resolution, try to your best to keep it! I know I will do my best to keep mine. So here's to 2010! I just hope it doesn't go by as fast as 2009 did!